TIP: Stores have great sales following Halloween! Fill up your dress up box with all your lucky sale finds! 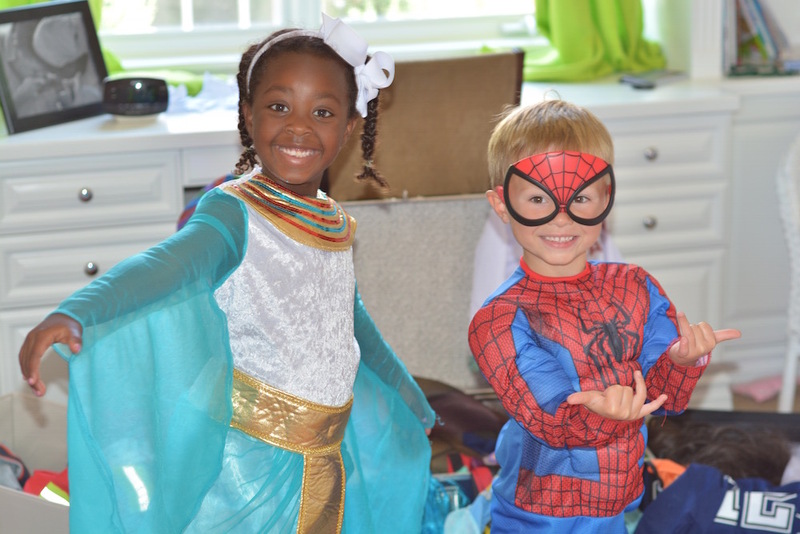 Playing dress up is such a great way for children to use their imaginations. My mother has saved old clothes and bought fun hats, jewelry, and outfits from rummage sales, all for the purpose of keeping a dress up box for her grandkids. It’s such a big hit with the kids, in fact, that other neighborhood children have come around to play with Mimi’s dress up box. Dress up allows kids to role play. Through role playing, children can experiment with behaviors and vocabulary. They express themselves creatively through fantasy. Dress up benefits children intellectually, socially and emotionally. My children have their own box of dress up clothes at my home as well, made up of clothing I’ve found in the discount section after Halloween, clothes I no longer need, and interesting finds at rummage sales. Dress up activity: My kids asked me to record them playing dress up on video so that we could all watch their “movie” together afterward. IPhones make it so easy now with the iMovie app. You can easily edit your movies and set them to music. It’s a fun way to create a home movie for your kids to enjoy now, and in years to come.